The quantities depend on the size of your saucepan, vegetables and how much stock you want to make. I normally use a size 20, Le Creuset saucepan, which will hold about 3 pints of water (though you won’t get that much in when full of vegetables). Cast iron saucepans are very good for slow cooking since they hold the heat. Le Creuset may be the best known brand, but in terms of cooking any cast iron brand will do. I normally use a couple of sprigs of the parsley, rosemary, sage and thyme, with the bay leaves, salt and pepper. Add 4 sticks of celery, a few carrots, 2 medium onions and some garlic. If new carrots are available with tops, use a couple of carrots, wash the tops carefully and add them too (they have a lot of flavour). Fill the saucepan to a sensible level – you don’t want it to boil over. Bring to the boil and simmer for an hour or so. Allow the contents to cool and discard all the vegetables and herbs. There’s no need to chop any of the vegetables, other than to fit them in the pan. When I am making a meat stock from bones and giblets, I use a pressure cooker. These are larger than the above cast iron pan and are normally made of stainless steel. My pressure cooker holds about 5 litres – this is a common size. For a meat stock I add the same amount of vegetables as above, plus the bones and any offal. 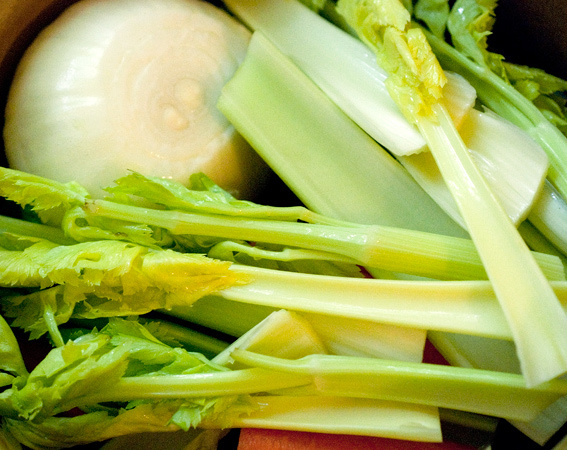 I would generally use less water than for a vegetable stock, in order to produce a concentrated flavour – be sure not to go below the safe minimum for your pressure cooker (see the instruction book for details). A pint is about right for me and above the safe minimum with my pressure cooker. The pressure cooker will cook the stock perfectly in about 20 minutes from reaching the correct pressure. The carrots, celery and onions are the most important ingredients here. I would normally use the same quantities (as per vegetable stock), but with chopped vegetables, for almost all pot roasts, e.g. pheasant, pigeon, etc. This entry was posted in Recipes and tagged bay leaves, black pepper, bouquet garni, carrots, celery, garlic, herbs, onion, pressure cooker, recipe, salt, stock. Bookmark the permalink.